Whether you live and work in Sacramento, CA, you commute from Elk Grove, or you’re an after-hours adventure-seeker in the California backcountry, a modern, stylish, and reliable vehicle is a must-have. The Honda Pilot fits the bill perfectly, and it’s been refreshed for 2019. With more technology, aggressive looks, and space for up to eight, there are plenty of reasons to check out the 2019 Honda Pilot for sale at Mel Rapton Honda in Sacramento. Here are just five of those reasons. The redesigned Honda Pilot has a refined style that includes standard low-beam LED headlights, larger integrated fog lamp openings, streamlined body lines, and bits of chrome and textured black plastic to draw your attention. And behind those sculpted features is a playfulness that draws you in. Turn signals are thinner and wheels have a more rugged design in sizes up to 20 inches. The interior has seen numerous upgrades as well including available 3-way heated front seats, wider fold-down front armrests, and second-row sunshades for EX-L trims and higher. Hands down, it’s the most advanced Honda Pilot to date. For the first time, CabinControl and CabinTalk are available in the 2019 Honda Pilot. CabinControl features a downloadable app that allows simple control inside your Pilot including the audio system, Rear Entertainment System, and rear climate control. Users can also send navigation destinations to the driver. CabinTalk, first introduced on the Odyssey, is included on Honda Pilot Touring and Elite trims and available on the EX-L with navigation and rear-seat entertainment. When used, it mutes the rear audio and transmits the driver’s voice to the second- and third-row passengers through the rear speakers, wireless headphones, or both. If keeping your smartphone charged has been a challenge, you’ll be happy to hear that Wireless Smartphone Charging is standard on the Elite trim and available on EX and higher models. And yes, the Honda Pilot also has a 4G LTE Wi-Fi hotspot available. 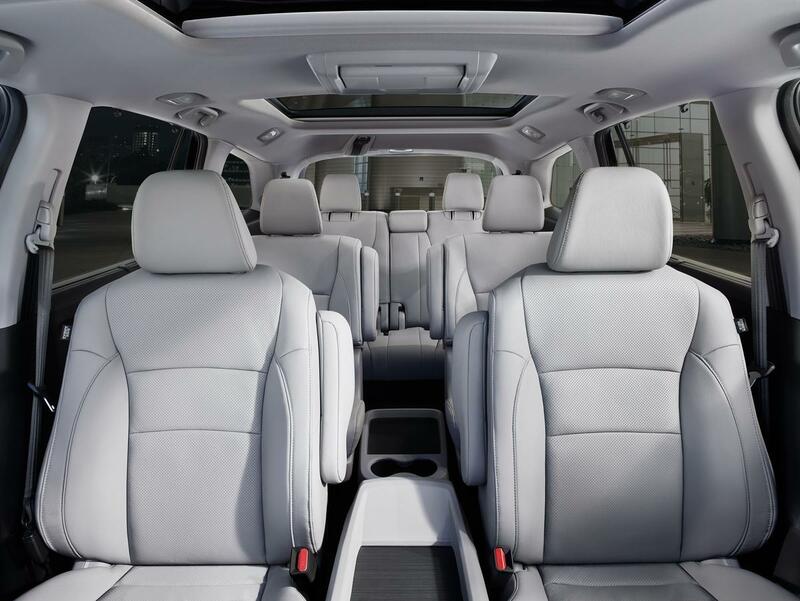 Whether your chosen Honda Pilot has seating for seven (with second-row captain’s chairs) or eight, everyone has a great view of the available Rear Entertainment system. A ceiling-mounted 10.2-inch display swings down and can be heard through speakers or the supplied wireless headphones. Connect gaming consoles or media players with the integrated HDMI connection or play CDs, DVDs, and Blue-ray discs. For the 2019 model year, the Honda Pilot becomes well-guarded with standard Honda Sensing technologies. 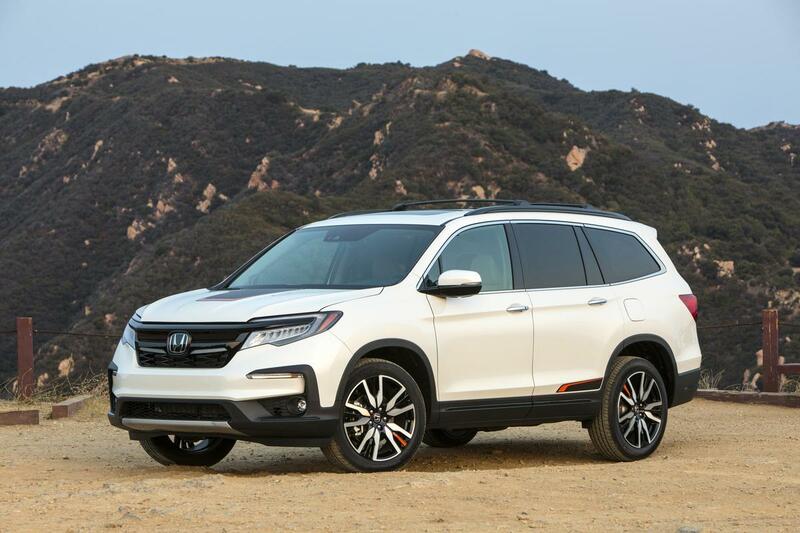 That means Collision Mitigation Braking System, Road Departure Mitigation System, Lane Keeping Assist System and Adaptive Cruise Control are found on every 2019 Honda Pilot. Add to that safety equipment Multi-Angle Rearview Camera and automatic high beams as standard on all trims, and you’ve got the makings of a top-pick. What could take it even further would be Blind Spot Information System and Rear Cross Traffic Monitor, right? You’ll find those on the Pilot EX, EX, and Touring trims too. A powerful three-row SUV with available AWD, amazing tech, and fantastic safety. It’s the refreshed 2019 Honda Pilot, and it’s available now at Mel Rapton Honda in Sacramento, CA.